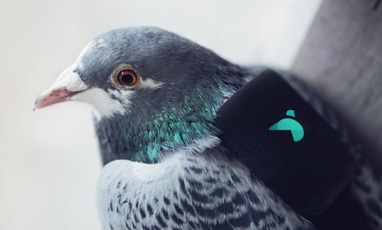 French start-up PlumeLabs, Twitter and DigitasLBi have joined creative forces and launched a team of 10 pigeons carrying interconnected sensors, to monitor air pollution in London. The App is available on Android and Apple here. You can track the little Pigeon Air Police in real-time here. Moreover, if you Tweet them your area of London @PigeonAir they'll tell you how polluted it is! 2. Satellites, monitoring your beer since 2016! B. United International, a beer company, is using satnav and satcom to guarantee to its customers that their beverage of choice will taste exactly the the same on arrival in the U.S. as when they left the brewery in their country of origin, for a trip around the globe. Read more here. Texas-based NGO, Mercy Ships, uses #SatCom to connect volunteering medical staff on its floating hospital with patients in poor, difficult to access areas. In the future it is expected that video could be used more extensively for training African healthcare workers. Read more about the NGOs life saving missions and get involved here. 4. In Space we trust ! Russian Advertising Company AILove teamed up with Roscosmos in celebrating humankind’s achievements in space, from from Sputnik 1 through to Yuri Gagarin’s historical orbital flight to Philae’s comet landing. Powered by imagination and our natural curiosity the journey takes us further and deeper into our solar system. New Horizon flew by Pluto in July 2015 after a journey that took the spacecraft 9 years and 6 months .The probe is set to venture even deeper into the distant, mysterious Kuiper Belt – a relic of solar system formation. Your space suits await here! Catalog.Earth, a project aiming to document the world's landscapes most endangered by climate change in 360° video and audio, takes off thanks to a Kickstarter crowdfunding campaign. It started as an immersive data experiment relying on NASA’s satellite images. It’s now a race against time to document the fastest changing landscapes around the world. 7. Ever gazed up at the night sky and wondered: Where is everyone? Welcome to the Fermi Paradox! According to scientists for every grain of sand on every beach on Earth, there are 10,000 stars out there. Out of which, a new PNAS study assumes that our vast universe contains a total of 100 billion billion Earth-like planets. How many of these would be able to develop life conditions similar to Earth? If are to follow statistics...many. So where are the others? To put things into perspective click here.